Image caption Coastguard rescue teams worked with the police to remove the vehicle from Irvine Beach Park. A car had to be recovered by the coastguard after a driver followed sat-nav instructions on to an Ayrshire beach and got stranded. The Vauxhall Corsa with two women on board had travelled from Glasgow and was following instructions to get to Irvine Beach Park. However, the sat-nav directed them down an access road onto the beach. Both the driver and passenger were safe and the vehicle was pushed off the beach before high tide. 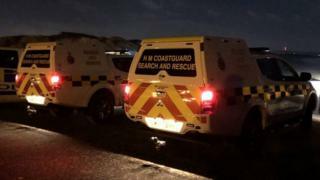 On its Facebook page, Ayr and Ardrossan Coastguard Rescue Teams said the vehicle was in a position that it would have ended up in the water once high tide arrived. They explained that "with the assistance of officers from Ayrshire police division, the team's off-road track mats and some old-fashioned muscle the vehicle was able to be recovered from the beach". The statement adds: "We would always advise people to only use their sat-nav system as a guide and not a replacement for traditional navigation and observation". The incident took place around 01:00 and the vehicle was still fully driveable, the statement added. A spokeswoman for HM Coastguard said: "At around 12.50am today we received a report that two women were stuck in a car at Irvine Beach. "Both Troon RNLI lifeboats, Ayr and Ardrossan Coastguard Rescue Teams were sent. "Coastguards ensured the persons were no longer at risk before the vehicle was recovered."